Iain Burnett creates his famous Velvet Truffles from a small kitchen in Grandtully in Perthshire where he is surrounded by quality fresh ingredients. The Velvet Truffles are created using heather honey & fresh cream from a single herd of local Friesian cows. 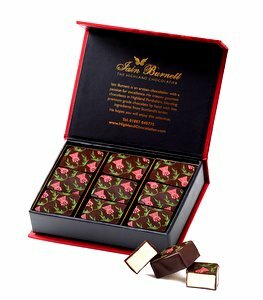 The quality of this cream is crucial to achieving the velvety, delicate texture and the rich sweet taste of Iain’s truffles. This fortnight has been chosen by Scotland Food and Drink to celebrate & support Scotland’s producers. Over the next 2 weeks we will be celebrating all things Scottish about Iain Burnett Highland Chocolatier, from the ingredients used in the chocolate kitchen, to Iain’s partnerships with award-winning producers from all over Scotland. 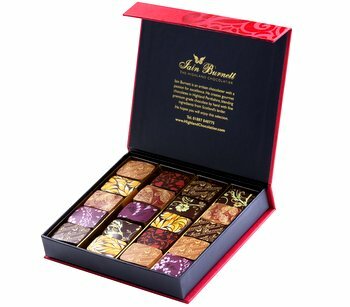 The Velvet Truffles have now won over 40 different International awards, including many Scottish awards. This special collection was created in honour of Scotland’s most loved poet, Robert Burns. 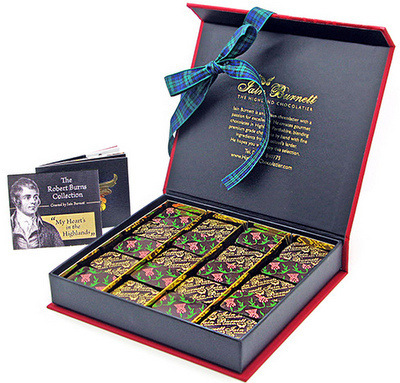 It features the unique Cranachan Velvet Truffle made with local Scottish heather honey, fresh crushed raspberries and white chocolate ganache, as well as the World’s Best Dark Chocolate Truffle. Using this fresh local cream together with fresh raspberries and beautiful golden heather honey from local apiaries Iain created the White Raspberry & Heather Honey Velvet Truffle. This box has been created to match with Eden Mill’s ‘Love’ gin, as well as Ledaig 15 year old Single Malt Whisky from Iain’s home town of Tobermory. Keep an eye on our social media channels over the next couple of weeks to hear more about the Scottish heritage of Iain Burnett Highland Chocolatier.